Will the New VW Electric Microbus Live Up to Its Predecessors, for Camping? We’re taking a small break from the usual van camping how-to’s for Vanlife’s blog this month, and taking a quick look at an upcoming van that’s gotten a lot of buzz in the media, lately: VW’s new electric microbus, or the VW ID Buzz. As we all know, the classic VW microbus, in its many passenger and campervan iterations, holds a special place in every outdoor enthusiast’s heart who has at least entertained the fantasy of living nomadically in a van. This vehicle is even an integral component of the modern American image of both the hippy and surfer subcultures. 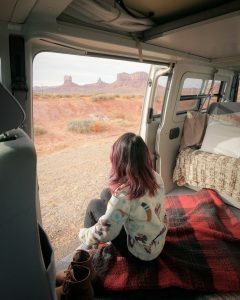 While any VW bus is iconic, it’s the VW campervan versions (Vanagon/Westfalia and beyond) which are especially dear to us at Rocky Mountain Campervans, particularly since they are one of our most popular campervan rentals. It’s our love for the VW microbus that has us looking towards the future, and curious about the electric microbus which VW has been promising for some years now. It’s clear from the footage we have from the van’s concept debut, the first iteration is not intended to be a camper. The design is futuristically minimal, with not so much as a button in the console, and the standard two back passenger seats. The roof also looks too low to accommodate even a campervan conversion. However, we at Rocky Mountain remain optimistic that there will, indeed, be a completely electric VW camper van. Why? Well, the simple answer is: How could there not be? To say that VW would pass up on the well-known market for campervans, AND the overlapping market for eco-friendly electric vehicles would be absurd. However, it does seem likely that the first version of their electric van won’t be a camper. That doesn’t mean that electric VW campervans aren’t coming, it just means they won’t get here as soon as we might like. In the meantime, VW has continued to make excellent modern campervans that still run on gas, such as the Transporter 5 California. In total, Rocky Mountain Campervans is proud to have several VW campervan rental options, ranging from the classic Vanagon Full Camper to the modern Eurovan, complete with climate control, wardrobe closet, and pop-up roof. Whatever your preference, we can outfit you for your Colorado adventure with a van that will fulfill your dreams of a Volkswagen escape into the majestic scenery of the American West.